Walsine Pierce: WALK LIKE A DUCK, QUACK LIKE A DUCK, GOTTA BE A DUCK! RIGHT? WALK LIKE A DUCK, QUACK LIKE A DUCK, GOTTA BE A DUCK! RIGHT? BUT THEIR ECHOS ARE TRULY ENDLESS! The word "gossip" comes from "go sip", a political instruction to sit in the tavern, sip a drink and listen to conversation. The "go sip" became gossip. 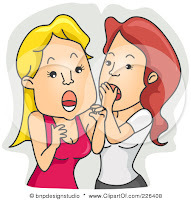 John Wesley opined that of all gossip, religious gossiping is the worse; it leads to uncharitableness, and effectually does the work of the devil in the name of the Lord. Never trust your tongue when your heart is bitter! Mildred, a middle aged widow and self-appointed monitor of the church's morals, kept sticking her nose in other people's business. She frequently did not have all the facts, stating that "If it walks like a duck, and quacks like a duck, it's a duck!" Although the other church members did not approve of her extra-curricular activities, they feared her enough to maintain their silence. Except for Frank. Mildred made a mistake when she accused Frank of becoming an alcoholic after she saw his old pickup truck parked in front of the town's only bar. "Walk like a duck, quack like a duck, it's a duck!" Frank, a man of few words, stared at her a moment, smiled and walked away. He didn't explain, defend or deny. He said nothing. Later that evening, Frank quietly parked his pickup truck in front of Mildred's house, walked home....and left it there all night. "Walk like a duck, quack like a duck, gotta be a duck, right? thou wilt speak twice the better for it. I think I know Mildred! haha! Great story and a good lesson for all.